I’m sitting here sweaty and gross after a nice, long yoga session trying to figure out what my Pintrest project of the day will be today. Which got me to thinking more about Pintrest and how people (women mostly) use it. Is it mostly aspirational? A catalog of possessions? A window into what you hope your life looks like to outsiders? For me, it’s a place to catalog things I have, play around with outfit ideas, and log inspiration for my books. But I hear the phrase “Pinterest Perfect Life” more and more. What does that even mean? That you’re awesome because you and your family look good on the screen? I don’t really get it. But of course I don’t. I’m smearing turmeric on my face and documenting it. Anyway, back to My Pinterest Life. Yesterday, the Colonel and I made construction paper bats. Originally, we were going to hang them from the low ceiling separating the cathedral ceiling from the kitchen ceiling, but the Colonel deemed it too much work for one day because it involved a ladder, string, and patience. Notice the Colonel peeking through the window? 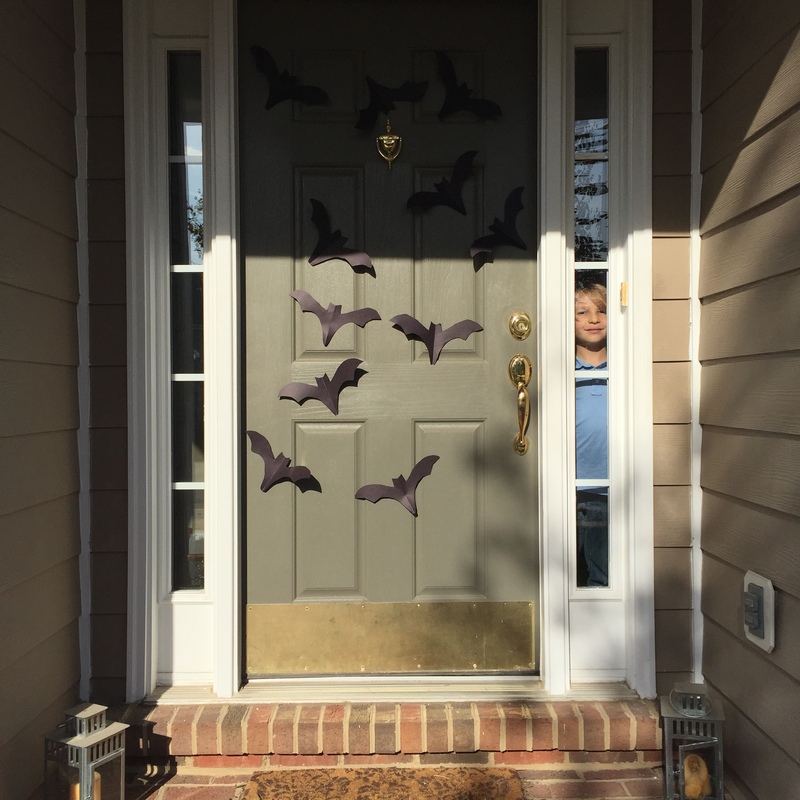 He said the bats were too creepy to come outside – LOL. But I’ll call this one a WIN. Easy to do with an 8-year-old and it didn’t take too long – unlike the time, pre-Pinterest, when I cut out dozens of construction paper mice to tape to our stairs and running boards. That was a Martha Stewart-induced moment of crazy. Next up, dinner. Dinner at my house is interesting. My eldest son has been a vegetarian since age three. He’s fourteen now. Needless to say, it’s not a passing phase. Plus, I have Celiac’s and have to be extremely careful around gluten or I rash out and become very ill. My middle son hates vegetarian food, and the Colonel won’t eat rice (I live on rice). So Apricot chicken is a mainstay in our house. It’s fast, tasty, and I can make Pudge a veggie version using Gardein vegetarian chicken. I decided to mix things up and try a new Apricot Chicken recipe. It could have gone very wrong, given that mine is a proven winner. After getting everything going, I realized I didn’t have any apricot jam – only peach. Guess what? My picky-eating crew didn’t even notice. Another Pinterest WIN. Lastly, I worked on my knitted cowl on-and-off yesterday, tearing it out, redoing it, and tearing it out again. I didn’t like how it draped with a seed stitch. Finally, I decided to double strand the yarn and do a basic knit and purl pattern. About five rows in, I dropped on of the strands of yarn and continued knitting so that the collar part is stiffer, but the rest of it will drape. At least I hope. Yeah, so that was My Pinterest Life yesterday. All WINS.